Planning a holiday can take hours, if not days. If you're not sure or set on specific dates to travel, Fareness can make finding your travel destination a breeze. Select the months you're open to travelling and the number of days you can spend and the site will suggest destinations based on their flight fares. You can also include hotels in your search, or only search for hotels instead. There's an interactive map that compares the suggested flights by city, and you can filter destinations by beach, Europe, outdoors and other types of destinations. 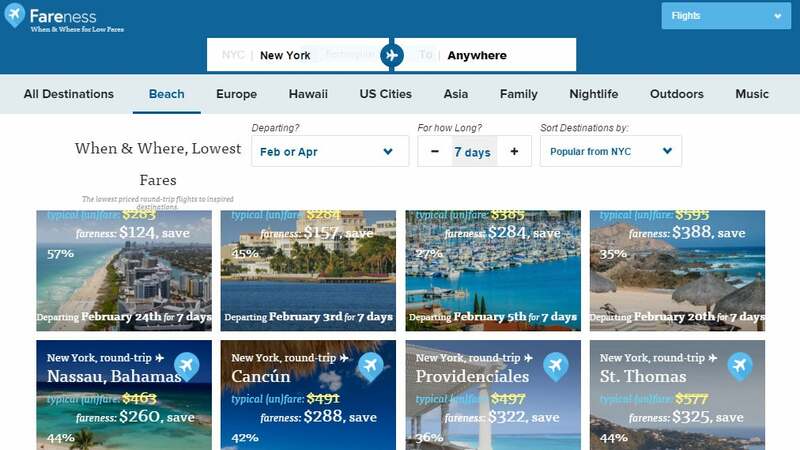 While there are too many travel planning sites out there to count, Fareness simply and easily lets you compare destinations for the next seven months. If you love to travel, it's worth bookmarking. meh, too US-centric...WhyTF would I go from Sydney to Portland (OR) for 7 days in March? There is a menu bar at the top where you can choose your destination.... but I wouldn't bother. There are a lot cheaper flights available elsewhere.